If you follow me on Twitter, you’ll be aware of how I excited I was to be visiting the Clothes Show Live this year. I’d never been before so I decided that this was the year to treat myself to a ticket. There was so much to see I highly doubt I saw it all. In fact, I keep seeing posts on social media from the stalls I missed…nevermind, there’s always next year! The highlight of the day for me – besides the shopping – was the Fashion Show. The staging was incredible and the choreography of the dancers/models fitted perfectly with the clothing, styling and music. I loved every minute of it and could have quite happily sat through it all again. I was really lucky as my seat was only a few rows back from the catwalk, meaning I was close to the action. 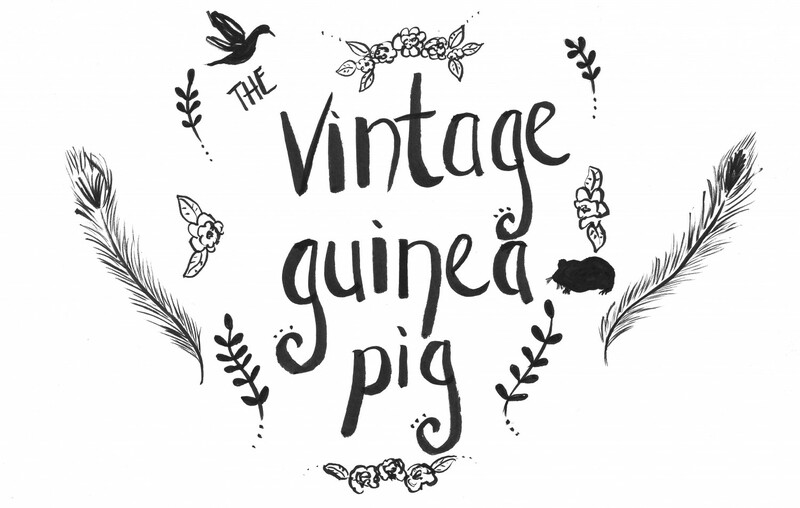 Over the next few days, I thought I’d blog a few of the things I bought. 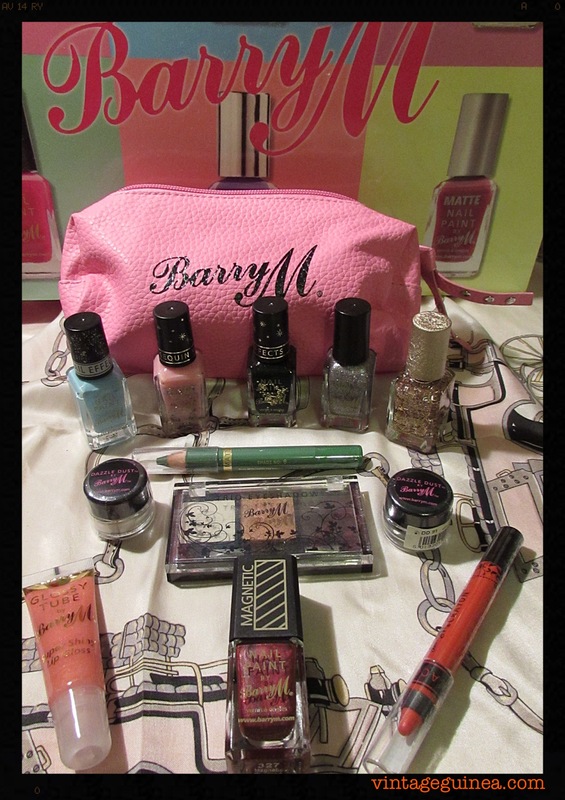 As I’m a MASSIVE Barry M fan, I decided to start with my lovely goody bag from their stall. These goody bags cost £10, which I thought was reasonable based upon the number of items in them (I often pick up three nail varnishes for £5 from Superdrug and the goody bag contained six). I wouldn’t have chosen some of the items or colours in the bag but it’ll encourage me to try new shades and products to see if they suit me. The goody bag itself was one of those brightly coloured cardboard bags you can sling over your shoulder and it will make a great present bag for Christmas! Inside the goody bag, the cosmetics were packaged in a nice quality pink faux-leather case with stud detailing on the zip pull. I liked the fact that, despite being heavily weighted in favour of nail products (which Barry M do so well), there was a range of eye and lip products too. For the eyes, there is a Trio Eyeshadow palate in metallic browns, glittery white Dazzle Dust (no. 8), glittery grey Dazzle Dust (no. 91) and a Matt Supersoft Eye Crayon in green (no. 6). The lip products consist of a Glossy Tube in pink and a Lip Lacquer Crayon in an orangey-red shade (no. 3). 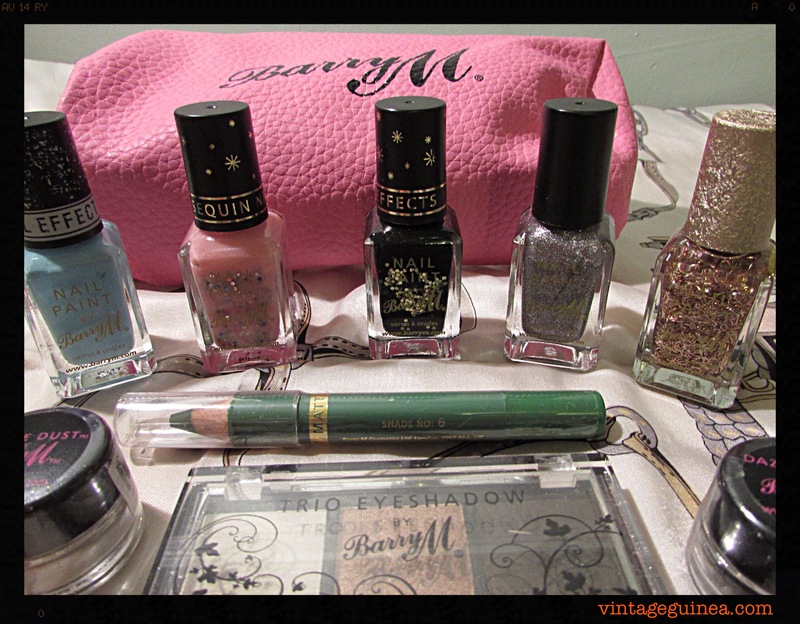 I’m going to be trying out the different products over the festive season (what better time for all that glitter? ), so if you would like see updates I’ll be posting them on Twitter. I’d also love to hear from any of you who have tried and liked or disliked any of them.